A firm belief in the potential of scholars to be world leaders drives the ethos of Genesis Global School. Leadership training is an essential part of the curriculum which equips these young minds with essential skills to be a leader in their own right. The aim is to inculcate in them ability to take decisions, build consensus, art of persuasion and character formation. The Aspirations of these young minds are groomed in the Classroom, on the Sports Field, via the School Council, Cultural Activities and Adventure Camps. The School’s aim of “Promising Futures” is designated to harness the Aspirations of these future leaders. GGS provides ample opportunities to its scholars to instil leadership skills through a variety of programmes. 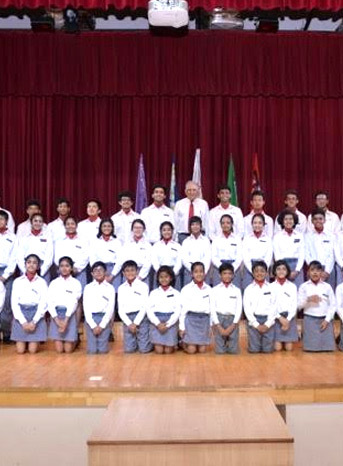 One of them being the Adventure based learning programme for Grades 4 to 12 aimed to bring out the Leadership qualities in them. The Program unfolds a series of individual / group tasks and outdoor activities. This is followed by personal reflection and group sharing. The total experience helps build strong character and interpersonal relationships along with a common set of new skills. The Program design and challenge level is customised to suit specific age groups. The Program is conducted in school by Youreka, a pioneer in adventure based learning for children in India with 20 years of experience to its credit. Inme is founded by a group of people with diverse backgrounds ranging from outdoor and adventure, behavioural sciences, the Armed forces to theatre and arts, education and entrepreneurship. Inme programs are outdoor adventure and challenge based experiences for 9-18 year olds that are conducted in the Wilderness. The Programs are an engaging mix of fun and learning and are designed and led by outdoor experts and behavioural science practitioners. The Programs use the Power of the Experiential method where participants pick up life skills, gain confidence, become independent, learn to work with others, and have opportunities to dig deeper into their potential. The On campus programs are typically 8-day experiences on one of Inme’s 5 campuses across the Country. Children stay in tented accommodation on camp and participate in activities, challenges, learning and informal fun sessions around the Campus. The Essence of modern day education helps open young minds to both introspection and new experiences. Important life skills can be developed experientially while having fun. It is an established fact that stepping out of your comfort zone is essential to have a meaningful learning experience. Outdoor and adventure based challenges lend themselves beautifully to provide opportunities to engage, learn by doing, stretch beyond ones limits and build on the success experiences – each a powerful component of a rich learning method. Staying in the Wilderness is a life changing experience. The lessons learnt in a challenging context demanding adaptation to situations and the environment are life long- they teach collaboration, team work, evaluating risks, decision making and the courage and conviction to own the consequences. This brings about a great internal realization for the realities of life and a respect for environment.